Kia sold 36,657 Souls in the United States through July, a 129 percent increase over the same period last year. LOS ANGELES -- Kia Motors America and its supply base are reviewing their manufacturing processes to track down what caused one driver to lose all steering ability in a two-month-old 2010 Kia Soul. The National Highway Traffic Safety Administration said Monday it had opened a preliminary investigation into the issue after it received one complaint from an owner of an almost-new Kia Soul who said the steering shaft decoupled from the steering wheel and then fell onto the driver's side floor in a way that interfered with the brake pedal. The investigation could affect more than 51,000 Kia Soul vehicles, NHTSA said. “Kia Motors America has been actively cooperating with NHTSA's Office of Defects Investigation since being advised by the Acting Director late last week that an investigation was being opened regarding the 2010 Kia Soul,” John Crowe, Kia's vice president of service, said in a statement. “Although the investigation is based on a single incident that did not result in an accident or injury, the entire Kia Motors organization -- including our supplier base -- is reviewing manufacturing processes with the goal of quickly determining if there is a manufacturing cause and preventing the issue from reoccurring,” Crowe said in his statement. NHTSA said its Office of Defect Investigation was “very concerned” that the reported failure happened “without warning” and in a two-month-old car after 4,300 miles (6,920km) of driving. “It occurred without warning on a new vehicle at low mileage and resulted in a complete loss of steering as well as a compromised brake system,” safety regulators said in a statement released on Monday. Kia is an affiliate of Hyundai Motor Co. It's unclear if other Kia or Hyundai vehicles share the Soul's steering system. 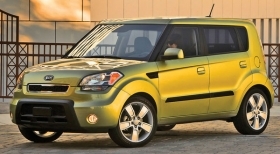 The Korean automaker sold over 36,657 of the cube-shaped Soul models in the United States during the first seven months of the year. The early success of the Soul, which has been marketed to the same younger drivers targeted by Toyota Motor Corp.'s U.S.-only Scion brand, has helped push Kia sales higher for the year. Through July, Kia's U.S. sales rose 16 percent to 205,488 vehicles, outperforming the 15 percent rise in overall U.S. industry sales, according to the Automotive News data center.